Over 1,500 peace activists surrounded the Bayerischer Hof Hotel in Munich, Germany, on Saturday, calling for the abolition of NATO, global disarmament, and solidarity with refugees. The protest was organized by the left-wing group Aktionsbündnis Gegen die Nato-Sicherheitskonferenz (Action Alliance against the NATO Security Conference), or anti-Siko for short. “At the so-called Munich Security Conference (SIKO) in February 2017, the political, economic and military power elites, mainly from NATO countries, the main responsible for refugees, for war, poverty, and ecological disasters, will congregate,” the group’s website explains. The police were initially expecting about 4,000 demonstrators to descend on Munich but less than half of that number showed up. Some 4,000 officers were deployed over the weekend, but the protest went off peacefully, and no incidents had been reported. 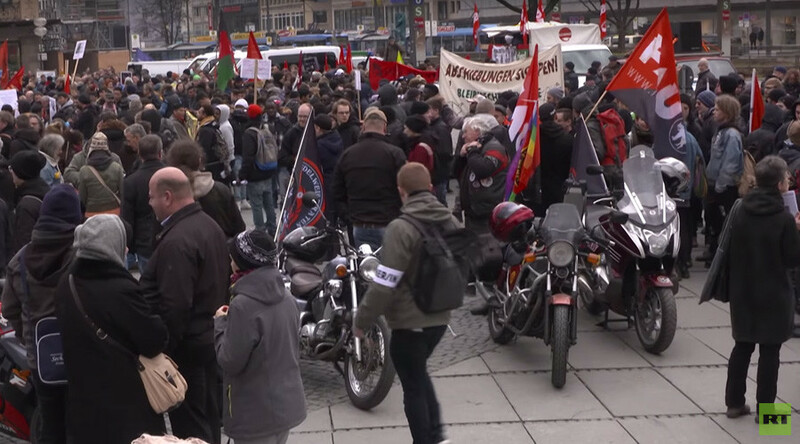 The protesters met at around 13.00 local time on Karlsplatz Square and made their way to the Bayerischer Hof Hotel, where a police cordon was erected to secure the conference being held inside. Over 100 delegates from countries around the world are taking part in the 53rd annual Munich Security Conference, including Russian Foreign Minister Sergey Lavrov, US Vice President Mike Pence and German Chancellor Angela Merkel.